Abnormal patterns of brain activity are demonstrated in patients diagnosed with schizophrenia [1,2]. Such abnormalities have been found in structural and functional brain imaging, as well as in cognitive functions involving attention [3,4]. More specifically, hemispheric amplitude asymmetry for auditory P3 ERP component has been reported in these patients [5-8]; however, little is known about lateralization of visual P3 ERPs. The aim of this study was to examine the presence and pattern(s) of visual P3 ERPs among schizophrenic patients. One of the best known cognitive ERP components is the P3. The p3 response is divided into two sub-components, namely P3a, and P3b. Different task conditions determine P3 scalp topography, which implies overlapping neural activations are involved, with initial frontal/central P3a and subsequent parietal P3b emerging . The paradigm usually is used to record P3b is the two-stimulus oddball paradigm, which involves the presentation of two distinct stimuli with differing occurrence rates. Individuals are asked to discriminate the infrequent target stimulus from the frequent standard stimulus. The P3b elicited by the target stimulus is a large positive wave with maximum amplitude over the parietal electrodes . Reduced P3 amplitude in response to auditory oddball tasks is among the most replicated findings in patients with schizophrenia . Some studies have demonstrated a similar finding of lower P3 amplitude in visual oddball tasks, while others have found no distinct differences between patients and controls [11,12]. In addition to a general finding of reduced P3 amplitude, differences in P3 topography have been reported in schizophrenia. Studies have found hemispheric amplitude differences in the auditory P3, with a smaller P3 distributed over the left temporal region, occurring in first episode, chronically ill and off-medication schizophrenia patients [13-15]. Jeon and Polish conducted a meta-analysis which supported the presence of reduced amplitude of auditory P3 in the left hemisphere of schizophrenic patients . Furthermore, left temporal scalp P3 amplitude reductions have been found to be highly correlated with severity of positive symptoms and concomitant left temporal cortical gray matter loss [7,16]. Finally, it is suggested that left-sided P3 reductions in schizophrenics could reflect abnormalities of a ‘generator’ located in the left superior temporal gyrus [5,14,15]. Despite the large body of evidence for auditory P3 amplitude asymmetry in schizophrenia, only a few studies have examined hemispheric amplitude differences in visual P3. Pfefferbaum et al. compared topographic distribution of visual P3 in schizophrenia patients taking maintenance medications versus those not taking maintenance medications. They found no differences in P3 ERPs distributions between members of the two groups . The present study was designed to examine the presence and pattern of lateralization of the P3b component in response to a visual oddball task in a group of schizophrenic patients. In a simple oddball discrimination task standard stimuli were presented unilaterally and target stimuli were presented bilaterally. Bilateral stimuli presentation was used, in which both hemispheres receive stimulus information directly and simultaneously. To evaluate ERP scalp distribution changes, early (N1) and late visual processing (P3b) waves in two homologous cerebral hemisphere sites were measured. Exploring of lateral differences for P3b ERP components might help to better understanding of impairment in information processing among schizophrenic patients. A group of 25 patients with schizophrenia (20Male) was recruited from outpatients of a psychiatric hospital. All patients met DSM-IV criteria for a life time diagnosis of schizophrenia. Patients were assessed using the Positive and Negative Syndrome Scale (PANSS) for schizophrenia , and received their antipsychotic medications at the time of testing. The mean chlorpromazine (CPZ) equivalent dose was 369.2 mg . Patients did not have a history of electroconvulsive therapy within six months prior to the testing time. The control group comprised 26 individuals (20Male) screened for a personal and family history of psychotic illnesses. Inclusion criteria for all participants were age between 18 and 45 years, being right handed and having normal or corrected-to-normal vision. Exclusion criteria included a history of head injury, neurological disorders, and current substances abuse. Written informed consent was obtained from all participants, and the study was approved by the Ethics Committees of Kerman University of Medical Sciences. Participants were seated in an electrically shielded and sound-attenuating room, with a head rest in front of a computer screen. The stimuli were white circles presented on a black computer screen. Each trial started with the presentation of a fixation point for 500 ms at the center of a computer screen. Then, circles briefly appeared (70-140 ms) in one or two locations at the corners of an imaginary square centered on the fixation point. On trials with frequent stimuli circles appeared at the left or right of the visual field. On trials with infrequent stimuli (target) circles were presented bilaterally. A total of 320 frequent stimuli (80%) and 80 target stimuli (20%) were presented in a random order. The time between the onsets of two trials was 2.5 or 3 seconds. Participants sat 60 cm from the computer screen. They were asked to fixate at the center of the screen and to press a right or left button as quickly and accurately as possible, whenever a unilateral or bilateral display was detected. The experimental apparatus consisted of a Mitsar-202 system (Mitsar, Russia) and WinEEG program developed at the Institute of the Human Brain, Russian Academy of Sciences. The EEG was recorded using a 32 channel cap (Electro-Cap International, Inc.), and referenced to linked earlobes. Electrode impedance was kept below 5 kOhm. EEG was sampled at 500 Hz with filtered online 16-30 Hz band pass. The ground electrode was attached to the vertex. Ocular artifacts correction was performed using an independent component analysis approach. Movement artifacts were excluded from analysis by careful visual inspection of the raw EEG. After final artifact rejection, ERPs were averaged relative to stimulus onset, including 200 ms prestimulus to 800 ms post-stimulus. The N100 was defined as the largest negative wave 100 -150 ms after stimulus onset and The P300 as the largest positive wave following the N100–P200–N200 complex between 250 and 700 ms after stimulus onset at the P3, Pz, and P4 electrodes. The peak latency was defined as the time from stimulus onset to the maximum peak. A generalized linear model (GLM) for repeated measures was used to test for group (schizophrenia vs. controls) differences on the dependent variables (target amplitude & latency) across the two trials (frequent, infrequent stimuli) (within-subject factor). Significant main effects, interaction, and follow-up pairwise comparisons were examined after adjustment for multiple testing (Bonferroni). A combination of chi-square and t-test was used on demographic and clinical data. All analyses were conducted using SPSS 16.0. Table 1 presents the clinical and demographic characteristics of patients and controls. The two groups were well matched for age, gender, education, and hand preference. Table 1: Demographic and clinical characteristics of the study participants. Both groups performed task over 95% accurate, the schizophrenia group (M=%95.1, SD=4.7) were significantly less accurate than control group (M = %97.9, SD = 1.9), (P=0.004). Moreover, the patients performed significantly slower (M=601.5, SD=176.3) than controls (M = 484, SD = 73.0), (p=0.004). Mean ERP amplitudes and latencies for each group are presented in Table 2. Table 2: Mean ERP amplitudes and latencies for each participant group in parietal electrodes. For N1 amplitude, the model showed a significant main effect of group (F1,49=6.3; P=0.015; η2=0.6). Schizophrenia patients had significantly smaller mean N100 amplitudes, for targets on all electrodes compared to controls. The main effect of N1 amplitude was significant (F1,49=36; P<0.001; η2=1) and N1 was larger on P3 than P4 electrode in two groups. The interaction effect between electrode and group was not significant (F1,49=1.3; P=0.2; η2=0.2), indicating that both groups similarly had larger N1 amplitudes over the left parietal than right parietal electrodes. 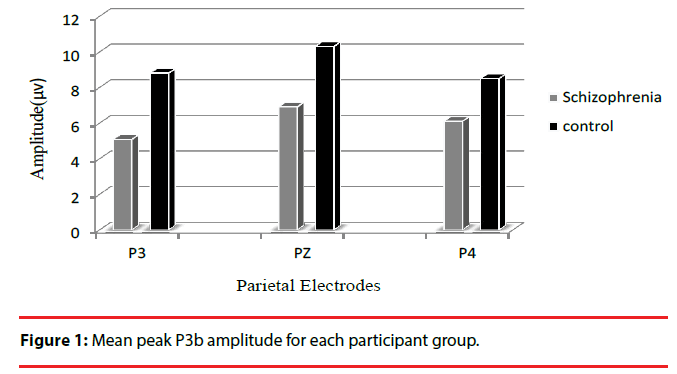 For P3b amplitude, the results showed a significant main effect of group (F1,49=5.7; P=0.02; η2=0.6) and patients had significantly smaller mean P3b amplitudes for target stimuli on all electrodes compared to controls (all P<0.02).The interaction effect between electrode and group was significant (F1,49=4.7; P=0.034; η2=0.5), indicating different changes in amplitude among electrodes between the two groups. Post hoc analysis showed that there was a significant amplitude differences between the P3 and P4 electrodes in patients (P = 0.017), and P3b amplitude was smaller on P3 electrode than on P4 electrode, however no difference was found between the two electrodes in controls (P=0.5) (Figure 1).The grand average ERP waveforms for the target stimulus at each electrode position are shown in Figure 2. Figure 1: Mean peak P3b amplitude for each participant group. Figure 2: Grand average event-related potentials from the target stimuli for parietal electrodes for both groups. To examine the effects of patient characteristics on P3b asymmetry, correlation coefficients (Pearson’s r) were calculated between left P3b amplitude (P3 electrode) with chlorpromazine equivalent dose, duration of disease, and PANSS scores. The results showed that the left P3b amplitude was not associated with the chlorpromazine equivalent dose and disease characteristics (all P>0.6). The present study aimed to examine whether the P3b component from a visual oddball task was laterally asymmetric in a group of schizophrenic patients, using a simple oddball discrimination task. In agreement with previous studies, schizophrenic patients exhibited smaller N1 and P3b responses to the targets in comparison to controls at parietal electrodes (P3, Pz, P4). Moreover, P3b amplitude from a visual oddball task was smaller over the left parietal than right parietal electrodes (P3 asymmetry) for target stimulus, whereas the healthy control did not show this asymmetry. Our finding extends and supports P3 studies that used auditory stimuli and reported significant left temporal area reductions of auditory P3 in patients with schizophrenia. They explained that the observed amplitude reduction might be due to larger structural deficits in left compared to right temporal areas, particularly volume reduction in the left superior temporal gyrus [5,14,15]. Although we cannot inference the underlying sources for the P3 amplitude asymmetry from this study, this effect might originate from primary electrophysiological, structural, or cognitive differences between the two hemispheres in patients. Our study showed that the maximal statistical differences between schizophrenia and controls were localized to the left parietal scalp region. A possible explanation for our findings of left –sided deficits in patients might be lateralized pathology in the generators of P3b, predominantly a generator located in the parietal lobe. Previous studies have revealed that P3b from target stimuli was correlated with parietal area size [9,19]. Particularly, Bledowski et al. found two parietal regions, the intra parietal lobe (IPL) and posterior parietal cortex (PPC), contributed to the visual P3b component . Interestingly, parietal lobe abnormalities, particularly IPL and PPC, have been found in structural and functional imaging studies of schizophrenia [21,22]. It should be noted that studies suggest that the pathology of schizophrenia involves multi focal diffuse abnormalities of brain structure and function, not a single or specific localized abnormality. Particularly, abnormality in a distributed network including the frontal lobe and parietal lobe, such as prefrontal-parietal functional disconnection is proposed . Thus, our result of reduced P3b over left parietal areas might reflect disruption of widespread neural networks including the parietal lobe in schizophrenia . Neuropsychological studies in healthy individuals have emphasized the role of the parietal lobe in several cognitive processes like attention, perception, memory, and motor planning, which have also found to be impaired in schizophrenia . Future research is required to investigate whether abnormalities in P3b asymmetry over the left parietal area is associated with cognitive dysfunctions in schizophrenia or not. Our results showed that patients had significantly smaller P3b amplitude than controls in all parietal electrodes. It should be noted that the p3 activity recorded from one electrode is dependent on the activity recorded from neighboring electrodes. Midline (Pz) voltage reflects the summed activity of both right and left parietal fields (P3 and P4 electrodes). Therefore, midline reduction of P3b in our patients could be at least partly explained by abnormality in one or two nearby electrical fields, which was mainly the left parietal field. Our findings showed that P3b amplitude did not correlate with clinical symptoms and chlorpromazine equivalent dose, suggesting P3b asymmetry was independent of medication effect and clinical symptoms. Reductions of P3b amplitudes over the left parietal lobe might be one of the underlying physiological processes involved in schizophrenia. Future research is needed to replicate this finding and examine left-sided P3b amplitude deficit in individuals who share some genetic vulnerabilities with schizophrenia such as schizotypal personality and first-degree relatives of patients. Our results showed that schizophrenia patients had smaller N1 amplitude than controls, though they did not exhibit asymmetry in N1 amplitude. This finding indicates that asymmetry in visual ERP components, presents at late-cognitive related components but not at early sensoryevoked component such as N1. Some limitations of the study should be mentioned. First, all patients were taking their medication, which might have affected the results. However, chlorpromazine equivalent doses were not significantly correlated with P3b amplitude, making any potential effect of medication on the finding unlikely. Second, the patient group was recruited mainly from an outpatient clinic and showed mild symptoms, thus they may not exactly represent individuals typically encountered in clinical practice or examined in previous schizophrenia studies, which may limit the generalizability of these findings. In summary, P3b amplitude elicited by a simple visual oddball task was smaller over the left parietal electrodes in schizophrenic patients, suggesting both midline and lateral electrode placements are necessary to provide reliable differences between patients and controls. Moreover, these lateralized amplitude effects may originate from asymmetric electrophysiological processes that govern attention operations on target stimuli. Sommer I, Aleman A, Ramsey N, et al.Handedness, language lateralisation and anatomical asymmetry in schizophrenia: Meta-analysis. Br. J. Psych178(1), 344-351 (2001). Maruff P, Hay D, Malone V, et al. Asymmetries in the covert orienting of visual spatial attention in schizophrenia. Neuropsychologia33(10), 1205-1223 (1995). RibolsiM, Daskalakis ZJ, Siracusano A, et al.Abnormal asymmetry of brain connectivity in schizophrenia. Front. Hum. Neurosci8(1), 1010 (2014). Ribolsi M, Lisi G, Di Lorenzo G, et al.Perceptual pseudoneglect in schizophrenia: Candidate endophenotype and the role of the right parietal cortex. Schizophr. Bull39(3), 601-607 (2013). Salisbury DF, Shenton ME, McCarley RW. P300 topography differs in schizophrenia and manic psychosis. Biol. Psych45(1), 98-106 (1999). Jeon YW, Polich J. Meta-analysis of P300 and schizophrenia: Patients, paradigms, and practical implications. Psychophysiology 40(5), 684-701 (2003). Gruzelier J, Richardson A, Liddiard D, et al.Opposite patterns of P300 asymmetry in schizophrenia are syndrome related. J. Psychophysiol34(3), 275-22 (1999). Alexander JE, Bauer LO, Kuperman S, et al.Hemispheric differences for P300 amplitude from an auditory oddball task. Int. J. Psychophysiol21(2-3), 189-196 (1996). Polich J. Updating P300: An integrative theory of P3a and P3b. Clin. Neurophysiol118(10), 2128-2148 (2007). Neuhaus A, Popescu F, Rentzsch J, et al.Critical evaluation of auditory event-related potential deficits in schizophrenia:evidence from large-scale single-subject pattern classification. Schzophr. Bull 40(5), 1062-1067 (2014). Neuhaus AH, Hahn E, Hahn C, et al.Visual P3 amplitude modulation deficit in schizophrenia is independent of duration of illness. Schizophr. Res130(1-3), 210-215 (2011). Pfefferbaum A, Ford JM, White PM, et al.P3 in Schizophrenia Is Affected by Stimulus Modality,Response Requirements,Medication Status, and Negative Symptoms Arch. Gen. Psychiatry46(11), 1035-1044 (1989). Faux SF, McCarley RW, Nestor PG, et al.P300 topographic asymmetries are present in unmedicated schizophrenics. Electroencephalogr. Clin. Neurophysiol88(1), 32-41 (1993). Salisbury DF, Shenton ME, Sherwood R, et al. First-episode schizophrenic psychosis differs from first-episode affective psychosis and controls in P300 amplitude over left temporal lobe. Arch. Gen. Psychiatry 55(2), 173-180 (1998). Salisbury DF, Voglmaier MM, Seidman LJ, et al.Topographic abnormalities of P3 in schizotypal personality disorder. Biol. Psych40(3), 165-172 (1996). McCarleyn R, O'Donnell BF, Faux SF, et al.Auditory P300 Abnormalities and Left Posterior Superior Temporal Gyrus Volume Reduction in Schizophrenia. Arch. Gen. Psychiatry50(3), 190-198 (1993). Kay SR, Fiszbein A. The Positive and Negative Syndrome Scale for schizophrenia. Schizophr. Bull 13(2), 261-276 (1987). Gardner DM, Murphy AL, O’Donnell H, et al.International consensus study of antipsychotic dosing. Am. J. Psychiatry167(6), 686-693 (2010). Ford JM, Sullivan EV, Marsh L, et al.The relationship between P300 amplitude and regional gray matter volumes depends upon the attentional system engaged. Electroencephalogr. Clin. Neurophysiol90(3), 214-228 (1994). Bledowski C. Localizing P300 Generators in Visual Target and Distractor Processing: A Combined Event-Related Potential and Functional Magnetic Resonance Imaging Study. J. Neurosci24(42), 9353-9360 (2004). Bellani M, Cerruti S, Brambilla P. The potential role of the parietal lobe in schizophrenia. Epidem. Psych. Sci19(2), 118-119 (2010). Yildiz M, Borgwardt SJ, Berger GE. Parietal Lobes in Schizophrenia: Do They Matter? Schizophr. Res. Treatment61(), 01–15 (2011). Kim JJ, Kwon JS, Park HJ, et al.Functional disconnection between the prefrontal and parietal cortices during working memory processing in schizophrenia: aH2O PET study. Am. J. Psychiatry160(5), 919-923 (2003). Van Der Stelt O, Frye J, Lieberman JA. Impaired P3 Generation Reflects High-Level and Progressive Neurocognitive Dysfunction in Schizophrenia. Arch. Gen. Psychiatry61(3), 237-248 (2004). Hutchinson JB, Uncapher MR, Wagner AD. Posterior parietal cortex and episodic retrieval: convergent and divergent effects of attention and memory. Learn. Mem16(6), 343-356 (2009).